Free Quilt Patterns & Sewing Projects from Havel's Sewing Scissors for fabric, quilting, embroidery and more at Havel's Sewing. Your source for unique tools for your fabric arts. Learn New Sewing & Quilting Ideas from the Pro's Who Know! Inside our Free eBooks you'll find wonderful sewing and quilting tips from some of our top fabric artists, like Liz Kettle, Terry White and Jamie Fingal. This is a work in progress, so check back often or click here to see the latest Havel's Sewing Blog. 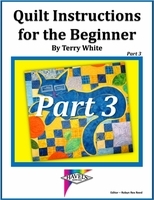 Download "Quilt Instructions for the Beginner Part 2"
Download "Quilt Instructions for the Beginner Part 3"
Download "Quilt Instructions for the Beginner Part 4"
And be entered in our monthly drawing for a FREE 5-piece Sew Creative Scissors Set! As well as receiving special offers, new product releases and free quilt and craft projects. Copyright © by Havel's Inc. All rights reserved.